Sanskrit can be a unique way to express yourself with a tattoo. 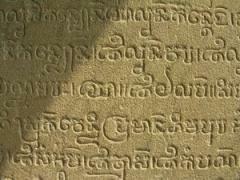 This ancient language is as important to the people of India as Latin and Greek are to scholars of other ancient societies and religions and is the root language for the modern Indian dialects. Consider some Sanskrit tattoo designs if you're looking for something out of the ordinary. Consider using both words and images in your Sanskrit tats. For the most part, people like to use Sanskrit tattoos to display their favorite spiritual quotes from Buddhism, Hinduism and other ancient eastern works. These quotes often reflect a personal philosophy they ascribe to. 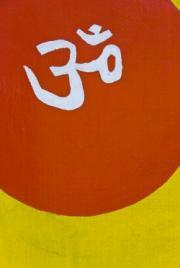 The fact that Sanskrit is written in verse form gives it added artistry and attraction. Here are a few worthy verses paraphrased from the Bhagavad Gita. The wise lament neither for the living nor the dead. No one can destroy the imperishable soul. For the soul, there is no birth or death. With over 700 verses, you'll likely find something that speaks to your soul in the words of Krishna. However, almost any name or phrase can be converted to Sanskrit and turned into a tattoo. Once you've chosen your verse, pair it with a coordinating theme. Create an armband out of a Sanskrit word. Circle a word or image within a Sanskrit word. 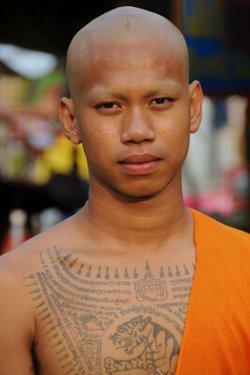 Where you choose to place your Sanskrit tattoo design really depends on the size of the design. A simple Om would look nice on an upper arm or outer ankle. Due to the somewhat chain-link look of Sanskrit writing, phrases can make very nice wrist or ankle bracelets. Larger works that include full passages of verse accompanied by enhancing designs often work best as chest or back tattoos. This allows the artist enough room to space out the writing so it is more legible to anyone familiar with the language. Indian tattoos are typically done in henna, a type of strong brown vegetable dye that eventually fades away. However, it's completely acceptable to have your design created using permanent tattoo ink, as well as any colors you like. Regardless of the genre, modern tattooing is always about personal expression. Tattoos by Design: Have your favorite phrases translated into Sanskrit, but be aware there is a charge for this service. Metta.org: Metta offers a list of popular Sanskrit translations for various English words. The translations give you the correct word, but not the actual Sanskrit writing of it. Still, you can take this to a specialty tattoo artist who should be able to write it in Sanskrit for you. Sanskrit Dictionary: A complete Sanskrit and Tamil dictionary that translates English words and phrases while explaining the alphabet and sentence structure. Sanskrit is undoubtedly beautiful to look at, and it seems to add a deeper spirituality to any tattoo design into which you incorporate it. However, there is always a risk to getting a tat in a language that is not your own. If you choose a particular word or phrase to use, be sure to cross check it with more than one translation source to make sure it carries the meaning you want it to. It is possible for an individual website or artist to make a mistake. Sanskrit tattoos may seem like the latest fad in tattoo design, but this truly isn't the case. Eastern cultures have used this language in their body art for many centuries. It is only now becoming popular in the Western world as multi-culturalism takes hold.